their life, their job and/or their relationships. Must there not be more to life than that? We work hard, we have earned material benefits for our immense efforts, we can afford lots of nice things. And actually, we think that we should be very happy. But instead, we feel this void inside ourselves and no matter how many things we treat ourselves with, how many steps we take on the career ladder - it just never seems enough to fill that void. A bigger car, a bigger house, more clothes, another vacation, more toys for the kids, a bigger TV, the latest smartphone etc. We enjoy these things for a little while but then it is back. We feel guilty, because we should be happy and yet are not. We think back to times in our childhood, when we were just enjoying life, not having to think or worry about anything. How nice would it be to be that free again! We feel trapped but don't see any way out. Because the world is just working the way it is. We need this job to pay for all these things we own, to be safe when we are old and to offer our children a good life now and a better future than we had. Once I retire, I get to do all the fun things I am dreaming of now. Then I will be free, then I can do whatever I want. We are caught in this treadmill. But for now, we are caught on this treadmill. Congratulations! Although it does not feel like this right now, this is a very good thing. Because you have received the wake up call. And by reading this - you know now that you are not alone. It is time - Wake up! Waiting for retirement cannot really be the serious answer. Life is not about suffering, it is about enjoyment. It is an experience to be lived and we should make the best out of it. But we were programmed to believe that suffering is necessary to enter paradise after death. Guess what? You can have your paradise right now. We have forgotten a tiny bit of information, which is very necessary to rediscover for ourselves again. And this is what this wake up call is all about. It alerts us to that inner calling. Our true self is trying to get to the surface to show us that there is so much more in it for us than just existing. It reminds us, that the answer to inner peace and happiness can never be found outside of ourselves. We carry the key within. Paradise is inside of each and every one of us. Unfortunately we have locked that door for ourselves because society taught us something else. Have you seen "The Matrix"? It seemed like a science fiction piece, but actually, we are not so far away from that. In that film, people are programmed to experience certain things without being in a real world. All of what they experience every day are illusions and projections. 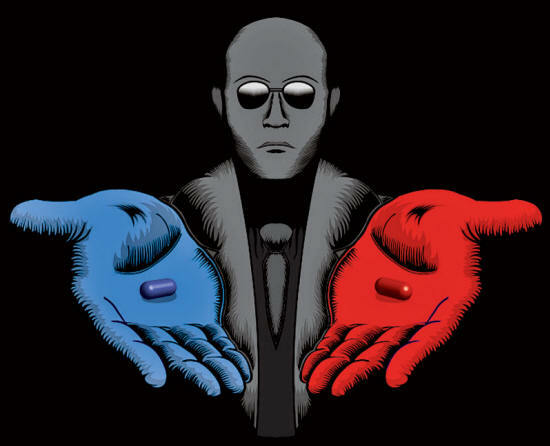 When Neo - the main character of the film - comes out of the Matrix for the first time and is asked to support to save humanity and bring it back to its true existence, he is asked if he wants to swallow the red or the blue pill. 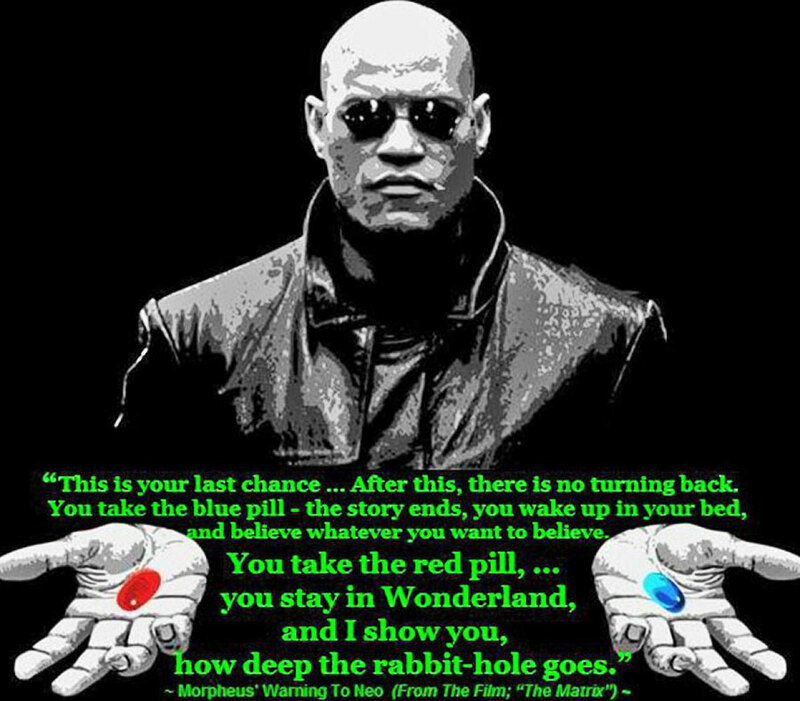 The red one will fully awaken him to reality and detach him from the Matrix programming. The blue one will put the veil of forgetfulness back over him and he will go back into the dream state within the Matrix. Although we are not in a state like in the film, where some machines take over the power and keep our bodies lying somewhere, plugged into a computer program, we are nevertheless in a state of hypnosis. "What...?" - you might think now, but I have my free will and I can vote and I can buy all these great things that I want to have, I can choose where I want to live and travel etc. Yes, true - but, is this true freedom? Why do we feel incomplete then? Nature always does a perfect job in creating its beings and keeping everything in balance. So, what went wrong with the human species? From a very young age, we are programmed. Societal conventions and behavioral patterns are ingrained into our system and mind at a very young age. Our parents teach us what they had been taught. Not to trust any strangers, that the world is a dangerous place, that there is not enough for everyone and that you have to be better than others to be able to make it in this world. They show us how a relationship should be and teach us the roles that we should take in life. Being the good wife and mother taking care of everyone and making everyone happy. Being the successful and strong husband and father that earns enough money and protects the family. At a very young age, girls are taught how to look good and how to be attractive, how to be a good girl and behave helpless and weak, so that you get a good catch later that takes care of you. Boys get programmed that crying and showing emotions other than anger is a sign of weakness and not male at all. We go to school and we are taught a lot of rather useless things that are all just food for the head. History, politics, geography, law etc. All things we learn to forget a big portion of again right away. We get grades to foster the competition between our fellow students. We learn to put conditions on everything and have expectations towards everyone. What we do not learn in school is teamwork, mindfulness, compassion, and being and appreciating our authentic self. We start our first job and believe what our parents and teachers told us: We have to work hard for our money and we need to be better than the rest. The competition continues. We are kept in a feeling of separation. We are told that we are alone and somehow have to make it through boot camp earth although we do not even understand why we exist. We do not question it, because everyone is playing the same game. We watch TV or go to the movies to see Hollywood productions. They show us how our world should be in terms of romance and love or show us all the ugliness of this world and all the dangers and brutality. The news only talks about what is wrong in the world, what we need to fight and fix and how much hate and evil is out there. Rarely do they talk about all these amazing and good things happening every day on earth that outweigh the bad news big time! Commercials and Marketing program us in terms of what we need to want in life and what is needed to be someone that is accepted in society. The list goes on. We are not even aware of all of this is mental programming. To keep us in a state of fear. Because fear makes sure that we remain in a state of dependency. Dependent upon the government, dependent upon your job, dependent upon your partner and so on. Someone who is in fear can be easily controlled. Fear keeps us in a thinking pattern that we are not good enough and not worthy to receive love and joy. We are so used to these patterns, that we don't even see them anymore and take them for granted. We are convinced that this is our only reality. That is just the way this world works. How could we ever manage to get out of this? The key is very simple, but it is quite hard to dig it up. In order to leave these patterns, we have to learn how to love ourselves. Leaving a pattern of fear and growing into a world of love is what we have to do. By doing this, all of a sudden, we have access to a complete new self. Actually, that is our original self, the one we have forgotten about and locked into a cage. The one that knows exactly what we want. The one that knows what love is and is able to give and receive love with each and everyone around. Sounds cheesy? Yes, because you are associating love with the conditional love we were programmed with. That we need another person to make us whole. That we need respect and admiration from others to feel good. That is not the love I am talking about. Here, we look at unconditional love. A feeling of joy, awe and bliss that you sometimes get a glimpse of, for example when you are struck by the beauty of a moment in nature. In these rare moments, time has no meaning anymore, the head is completely shut off and all there is, is an immense feeling of being at peace with everything. And you know what? This is how life is supposed to be permanently. To be in a feeling of oneness with everything and everyone around us. It all starts with self-love. As long as we don't love ourselves and do not feel good enough, we will stay in a place of fear. We will not be able to share our love freely and unconditionally but will depend on the love of others. Have you ever met a person that seemed to be so at ease with him or herself and no matter what this person does, everything just seems to fall into place for them in a perfect manner? They seem to be always lucky, happy and in the flow? And you ask yourself what their secret is? They love themselves. They always put themselves first. They respect themselves and honor themselves for who they are. Not in a selfish way. They love to share but they know the difference between unconditional giving and unconditional love. They keep healthy boundaries. They don't care about materialistic things. They can still enjoy those, but they don't depend on them. They have rediscovered their intuition and follow it. They have recognized the difference between the programmed mind, also called the ego, and the free spirit - what the mind actually is, once it is freed from its ego-prison. They have silenced this little 24/7 chatter box inside their head, permanently jumping from past to future and back, worrying about everything. They have put their ego in the backseat so that it is not in the lead anymore. The texts I share are always based on my intuition ("downloads") and/or on experiences of clients and my own. I do not claim what I share to be the ultimate truth. I encourage you to only take what resonates to find your own truth and wisdom. As this is universal wisdom, I do not claim any copyright.